WATERTOWN, Mass.—From 1869 until just before the Great Depression, Hood Rubber Co. was perhaps the most recognized brand of rubber-soled shoes in the U.S. For nearly four decades, Hood Rubber diversified into various products before shutting its doors in 1968. Now a marketing and design company is taking on the Hood Rubber brand and re-launching high-end, high-quality rubber-soled shoes to the marketplace in a move that could be considered both risky and potentially rewarding. Starting with its fall line expected to be released this October, the company expects to offer 12 SKUs of shoes that will be sold for an estimated $265-$325 retail price, said Creative Design Director Marc Scepi.Hood Rubber is being launched under the ownership of San Diego-based Pinnacle Brand Group, which is a designer and distributor of men’s and women’s fashion footwear and accessories. The goal is to expand the product line in the spring to include more affordable options, starting around $125 retail, which will allow Hood Rubber to be sold into stores such as REI, an American retail and outdoor recreation services corporation, and other large outdoor chains. The higher-end shoes released in the first autumn line will be carried in such retailers as Bloomingdale’s and Nordstrom’s online store. A launch party for retailer Paragon will be held in early October, and many independent retailers also will carry the brand. Shoes also will be sold directly at www.hoodrubber.com. Pinnacle Group has trademarked the name and acquired the Hood Rubber brand. The story of the products and the quality of the rubber materials, though, is really what excites Scepi and fellow Creative Design Director Janelle Samson, who together are leading the design, marketing and sourcing efforts for the line. Hood Rubber will offer three types of shoe styles, including outdoor (walking, working type shoes), urban and trail (hiking, climbing) styles. The target audience is largely Millennials and successful urban dwellers with an eye on “metropolitan residents” looking for style and an aesthetically unique and pleasing product. However, the firm stressed that functionality must also be present. “One of the driving forces of our design was how would Hood Rubber have evolved had the product and brand never went away,” Scepi said. The shoes are made in Portugal, with the raw materials largely coming from Italy and Portugal. Investments have been made in factories in Europe to highlight the performance and technological aspects of the Hood Rubber shoes. 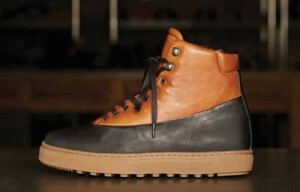 Every shoe has a nod to the heritage of the brand by using rubberized, coated leather features. Wool elements will be used as shoe accents. One of the style elements involves fusing leather welt to rubber on the sides of the shoes, which adds an aesthetic touch. The raw materials that make this kind of rubber possible are plentiful in parts of Italy, which makes having the shoes manufactured in Portugal ideal.